How do I know if my child has a hearing problem? 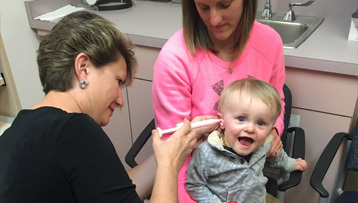 Although the vast majority of newborns in the United States receive a hearing screening before discharge from the hospital, hearing loss can occur at any time, and it may not be evident immediately. Severe or profound hearing loss may be obvious because the child may not respond to sound. But noticing milder forms of hearing loss—including hearing loss in only one ear—can be more difficult. That is why regular hearing evaluations as children grow and mature is so important. Because children learn to speak by listening, children with unidentified hearing loss often have trouble learning to speak, and they experience delays in their language and speech development. For this reason, it is important to pay careful attention to causes of hearing loss in children, and how quickly and well your child is learning to speak and understand language when compared to other children of the same age. If something doesn’t seem right, ask your doctor. What causes hearing loss in children is not always immediately evident. A lot can be done to help children with hearing loss! 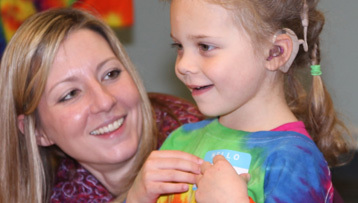 We know so much more today about helping children with hearing loss than we ever did. And there are more resources available than ever before. The key is to get the earliest diagnosis and intervention possible. This helps ensure that your child develops strong speech and language skills without any unnecessary developmental delays. Early diagnosis and intervention give your child the best chance for strong academic achievement and positive social and emotional development. Keep in mind: Parents usually suspect a hearing loss before the doctor does. So advocate for your child. Take them to a hearing healthcare professional to have their hearing tested. Pediatric hearing loss treatment can be an important tool in helping your child enjoy an active and fulfilling life. The pediatric specialists at BHSC have years of training and experience working with all ages of children, from very young babies through all of the stages of childhood and adolescence. A test called an ABR, or Auditory Brainstem Response, is a non-invasive way to test those who are too young to give a response to sounds or children who are unable to give a response for a variety of reasons. Audiologists also a variety of other procedures such as play audiometry and visually-reinforced audiometry which allow behavioral responses that are assessed and interpreted. When a child is old enough, they can use a traditional hand raise response to tones presented via headphones within a sound-treated room. Hearing Aid technology has advanced rapidly over the years. The audiologists at BHSC are specialists in selecting and fitting the most-up-to-date pediatric hearing aid technology available on the market. Early Intervention typically covers the cost of hearing aids for a child diagnosed before the age of 2.5 years if insurance does not. BHSC established the first cochlear implant center and implant team in Buffalo in 1998, and has seen over 500 patients. Our implant specialists work with the child and their families to guide them through the process from diagnosis of hearing loss to implantation, turning the device on, stimulating sound and beyond! Wireless and FM technology can help speech signals to bridge the gap of space and noise for hearing aid and cochlear implant users. This technology provides a more intelligible signal to the hearing aid to help the child succeed in different or challenging listening environments such as the classroom.